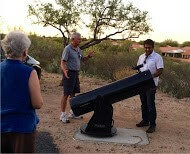 The Sun City Astronomy Club is a chartered club of Sun City Oro Valley. We are located in the town of Oro Valley, a suburb of Tucson, Arizona. With clear, dark desert skies and first-rate observatories, Tucson is often referred to as the Astronomy Capital of the World. Club meetings feature prominent guest speakers from local renowned astronomy organizations along with member presentations, videos, star parties, and trips to nearby observatories helping members to appreciate the night sky, the workings of the universe, and our place in it. Learn to identify stars, planets, and constellations with the naked eye and where to look for deep sky objects with binoculars or telescopes. The Club meets at 7 PM on the third Thursday of each month October through May at the Activity Center, Navajo Room. Club activities also include tutorial classes and community outreach.